With November being designated as Diabetes Awareness month, it’s important to discuss different methods of managing Diabetes among our aging senior population. Diabetes is a chronic disease that affects how we turn our food into energy. Our bodies rely on glucose for energy with the help of the pancreas. The pancreas regulates the hormone insulin, which allows our bodies to use glucose as energy. 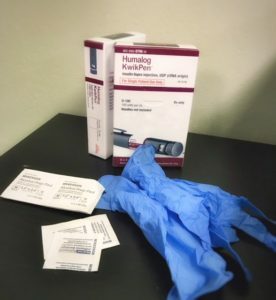 Individuals with diabetes, their bodies either do not produce enough insulin or their bodies do not respond to existing insulin, thus resulting high levels of blood sugar that can have a damaging effect on the body. There are 3 main types of diabetes, Type 1 Diabetes, Types 2 Diabetes, and Gestational Diabetes. Type 1 Diabetes, common among children. Type 2 Diabetes, commonly occurring among adults and is linked to diet and overall lifestyle choices. Gestational Diabetes, occurring primarily during pregnancy. Over 30 million Americans are afflicted with Diabetes, resulting in Diabetes being the 7th leading cause of death in the United States. Type 2 Diabetes is the most common form of Diabetes diagnosed. It usually develops over time and diagnosed during adulthood. However, in recent news the onset of Type 2 Diabetes has increased among children, teens, and young adults. Among the elderly in the United States, Diabetes is one of the most common chronic diseases affecting this aging population. 10% of adults diagnosed with Diabetes are 65 years or older. Within the next 20 years, the incidence of diagnosed diabetes among the elderly is expected to increase by around 44%, affecting a total population of 3.9 million people. Elderly people diagnosed with diabetes tend to visit their primary care provider more frequently to manage their diabetes. Around 30% of diabetics 65-74 years old are hospitalized each year. This rate is nearly twice of that compared with elderly without diabetes. Circulatory and Cardiovascular problems are often association with diabetics 65-74 years old. Resulting with diabetic elderly having a higher incidence of death due to cardiovascular disease compared with non-diabetic elderly. There are many ways to help our aging seniors manage their diabetes. A healthy diet is one important aspect to consider when managing diabetes. A diet low in sugar and saturated fats are ideal for any diabetic senior. In addition, adding exercise to a diabetics daily routine help to not only control glucose levels but also manage weight. Aerobic exercises like walking, biking, and swimming are great examples of aerobic exercises that a diabetic seniors could participate in. Regularly checking blood glucose levels is another important facet in the management of diabetes. It’s important that diabetic seniors stay consistent with monitoring their blood glucose level. Lower blood glucose levels could result in hypoglycemia state for the senior (low blood sugar). Some common symptoms are confusion, dizziness, hunger, and sweating. Aside from monitoring blood glucose level, regularly taking diabetic medications is just as important as monitoring blood glucose level. Lastly, having your feet checked by a podiatrist and eyes checked by an optometrist are both important tools to help our seniors manage their diabetes. There are a wide array of resources available to help our aging seniors to manage and prevent the prevalence of diabetes. Taking proactive steps to prevent and maintain diabetes can have a long-lasting impact towards the overall prevalence of Diabetes among American Seniors.